You now have the freedom to use JFrog Artifactory. The most popular DevOps tool that was only available directly through JFrog, but is now available on the AWS Marketplace. 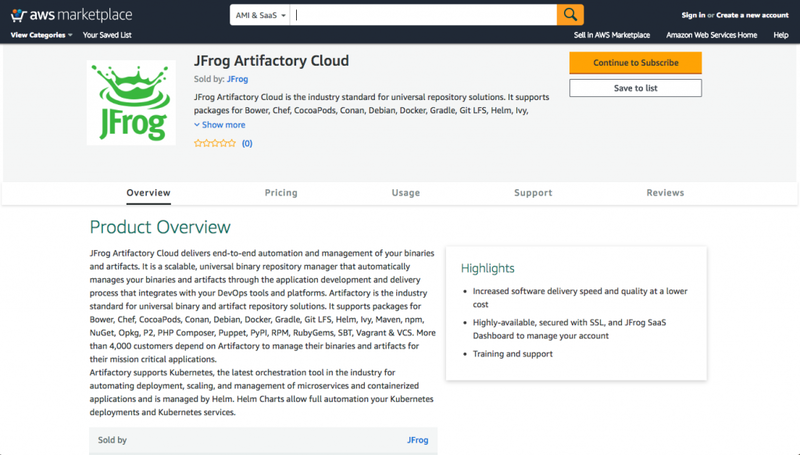 The new offering is called JFrog Artifactory Cloud. As many of you know, Artifactory is the industry standard for universal binary and artifact repository solutions. Artifactory Cloud is hosted on AWS EC2, supports containers, Kubernetes, Helm, Docker and all major package formats (20+ package types) and integrates with your DevOps tools and CI servers. But the benefits don’t stop here. Delivering higher quality software faster at a lower cost to better compete in the market and brings you ease of purchase and all-in-one billing. Immediately enables you to benefit from the end-to-end automation and management of your binaries and dependencies. Removing the traditional procurement and approval process and need to install, operate, and upgrade your software, while eliminating the overhead of managing servers and virtual machines. Think how much more productive and efficient you can be without having to worry about all of this. Training and unbeatable around the clock R&D-level support. Artifactory Cloud supports Helm, which streamlines the installation and management of Kubernetes applications. One might argue that it doesn’t matter to them. But we all know that in less than a year, Kubernetes has become the leading orchestration tool for automating deployment, scaling, and management of containerized applications. So if you are using Docker, Artifactory Cloud can become your Kubernetes registry for managing your Docker images. You gain valuable insight throughout the development and deployment process by providing traceability to all your artifacts as well as their dependencies (including Maven, npm, Debian, RPM, and more) across all Docker images, applications, and components for all your versions. For more information on how Artifactory Cloud can easily serve as your Kubernetes registry, see JFrog Artifactory: Your Kubernetes Registry.